This research developed and completed a field evaluation of salt distribution equipment. The evaluation provides a direct comparison of three different types of salt spreaders at three different truck speeds and rates of pre-wetting. 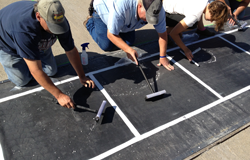 A rubber mat was divided into eight sample areas to measure the salt distribution across the lane by each variable combination. A total of 264 samples were processed and measured. These results will support future efforts to target areas of efficiencies specific to salt and brine delivery methods. These results support Iowa Department of Transportation efforts to progress winter maintenance efficiencies and ultimately motorist safety.